Atanasio Girardot Sports Complex (officially Unidad Deportiva Atanasio Girardot) is a sports complex located in Medellín, Colombia. The complex includes Estadio Atanasio Girardot, Medellín Sports Coliseum, Luis Alberto Villegas Stadium, and Alfonso Galvis Duque Stadium. 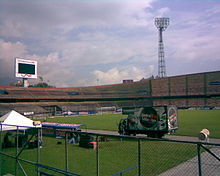 Atanasio Girardot Stadium is currently used mostly for football matches by two teams, Atlético Nacional and Independiente Medellín, two of the most successful and popular football clubs from Colombia. The stadium was built in 1953 and was renovated for the 2011 FIFA U-20 World Cup in Colombia to a capacity of 40,043. The stadium was named after Atanasio Girardot, a Colombian revolutionary leader who fought alongside Simón Bolívar. Medellin Sports Coliseum is a complex of five sports arenas: the Guillermo Gaviria Correa Coliseum for Martial Arts, the Jorge Valderrama Coliseum for Handball, the Jorge Hugo Giraldo Coliseum for Gymnastics, the Iván de Beodut Coliseum for Basketball, and the Yesid Santos Coliseum for Volleyball. The five gymnasiums were designed by Giancarlo Mazzanti and Plan B Architects. Three coliseums were renovated and two new coliseums were constructed in 18 months and with CO$50 million in preparation for the 2010 South American Games. The design has a wavy sloped green roofline and an area of 493,000 square feet. October 21, 2005 RBD 30,000 Concert Sold-out show. Atanasio Girardot Stadium before it was remodeled. ^ "FIFA U-20 World Cup Colombia 2011: Technical Report and Statistics" (PDF). es.fifa.com (in English, French, German, and Spanish). FIFA. 29 July – 20 August 2011. ^ "UD Atanasio Girardot | Escenarios Deportivos". www.inder.gov.co (in Spanish). Archived from the original on 2016-12-20. Retrieved 2017-03-23. ^ "Coliseos de Medellín fueron premiados en la Bienal Iberoamericana de Arquitectura". El Colombiano. 18 May 2012. Retrieved 19 January 2015. ^ "Daddy Yankee emocionado por nuevo disco y próxima gira | SonFamosos.com". 2013-01-19. Archived from the original on 2013-01-19. Retrieved 2017-03-23. ^ "New Tour Dates Confirmed In Mexico, Colombia, Brazil And Chile" (Press release). 16 April 2012. Retrieved 16 April 2012. ^ "Tuboleta.com -". Vive Tuboleta. Retrieved 2017-03-23. ^ Tiempo, Casa Editorial El. "¿Por qué se canceló concierto de Paul McCartney? / Columna del editor". El Tiempo (in Spanish). Retrieved 2017-10-28.